Renishaw is pleased to announce the introduction of the QuickLoad™ rail system to its range of metrology fixturing. The QuickLoad rail system has been developed for use on co-ordinate measuring machines and provides a secure workholding position when used in conjunction with QuickLoad base plates, which locate to the rail on either side using quick release magnets and location pins. 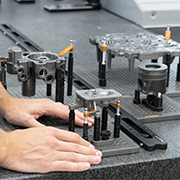 Global engineering technologies company Renishaw is introducing a ¼ 20 imperial thread size to its existing metrology fixtures product range. Customers globally will benefit from all fixturing components being available in M4, M6, M8 and ¼ 20 thread sizes. 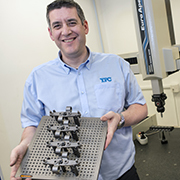 Yeovil Precision Castings (YPC) Limited has invested in a comprehensive Renishaw modular metrology fixturing system, to increase repeatability of part inspection and to reduce the time taken in its quality control activities. As a result, YPC claims to take up to 50% less time to check batch samples than it did previously. CMM fixturing is no longer the ‘weak link' that it once was. Renishaw is presenting FixtureBuilder at EMO Hannover 2017 taking place in Germany from 18th to 23rd September. FixtureBuilder is a 3D-modelling software package designed to allow the off-line creation and documentation of fixturing set-ups.